How well you pack for an interstate or overseas flight can sometimes affect how much you enjoy your trip almost as much as the trip itself. If you’re a bit of a ‘last-minute packer’ or haven’t been on many flights before, take note: hasty packing or trying to ‘pack light’ when it comes to your contact lenses can land you in all kinds of trouble later on—often in a foreign country where they don’t speak English. So, to make sure you actually enjoy your trip, and it doesn’t turn into a scene from The Hangover Part 2, here are some tips for packing and flying with contact lenses. When flying, it’s a great idea to take contact lenses, solution and your eyeglasses in your carry-on luggage on the plane. If you’re taking a short interstate flight this may not be so important, but if you’re about to go on one of those arduous long-haul flights halfway around the world, you’re going to want to be as comfortable as possible—trust me. The recycled air in planes can really dehydrate you—and it does the same thing to your eyes, which can make your contact lenses uncomfortable. Having supplies on board can help you deal with this while mid-air. And it’s also a good backup plan in case your luggage doesn’t arrive at your destination when you do. Of course, different countries and airlines have specific rules about how much liquid (and what types of liquid) you can take on-board a flight, so make sure you check with each airline before packing and flying. If you’re really trying to ‘pack light’ and you’d rather not have the hassle of carrying around your contact lenses, bottles of solution and a case while you travel, consider switching to daily disposable contact lenses for the duration of your trip. You’ll have a fresh pair each day or whenever you need to change them on a long-haul flight. Make sure you speak to your optometrist before changing to daily disposables to make sure this is a good solution for you. Shop for daily disposables in the EYESONLINE store. If you’ve ever been on a flight before, you’ll know that they pressurise the cabin. You’ll also know that this can wreak all kinds of havoc with things you pack in your suitcase or carry-on like bottles, fluids, and anything with air inside it. Decided to pack that favourite shampoo? Well, I bet you didn’t want it all over your clothes in your suitcase, now did you? Similar things can happen with your contact lens solution; so make sure you pack them in a sealed container or zip-lock bag. You’ll thank yourself later. Overseas travel can be filled with amazing, beautiful experiences, but it quickly turn into the holiday from hell if you don’t pack properly and aren’t prepared for the worst. If you lose your contact lenses or solution, you may not simply be able to ‘pop down the street and buy more’—particularly if you’re flying to a third-world country or one where they don’t speak English. Being prepared is the key to having a good trip. The last thing you want is for your contact lenses to ruin your holiday. When travelling, something seemingly minor with your contact lenses can become major pretty quickly. Because, let’s face it, if you can’t see properly, it’s going to be pretty hard to enjoy yourself! And, depending how bad your normal eyesight is, not being able to see properly in a foreign country, by yourself, could turn dangerous very quickly. So, to make sure you have a good time on your holiday, here are some tips for travelling with contact lenses. 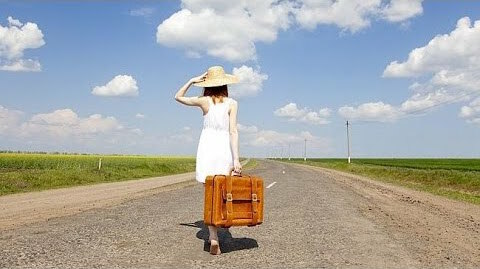 Packing ‘light’ is a great way to travel, but don’t try to save space by only taking 1 bottle of contact lens solution. In all the excitement of travelling—rushing from one place to the next—a bottle of lens cleaning solution is an easy thing to misplace or leave behind. It’s probably not something you’ve thought or worried about at home, as you can get more solution pretty easily. But it’s an entirely different scenario if you’re travelling somewhere you’ve never been before. Take at least 2 bottles of contact lens solution. Consider switching to daily disposable contact lenses while travelling so you don’t have to worry about lens solution. You never know when you’re going to need to tend to your contact lenses while travelling and, chances are, when you do need something, you will have left it back at the hotel room, or ‘in another bag’. Contact lens travel kits make things so much easier. They’re usually small enough so you can just slip them into a handbag, man-bag, or part of a backpack. Hopefully you’ll have a drama-free holiday and never need to even look at it—but you’ll kick yourself if you go travelling without all your contact lens information, especially if you’re headed overseas. Often the unexpected happens when travelling—good and bad—so it’s always smart to be prepared, particularly with something as important as your vision. Take your current contact lens prescription. Make sure you’ve got your optometrist’s contact details handy. If you’re travelling overseas where they speak another language, prepare a few key phrases to be able to tell people if you need contact lenses. When travelling, back-up plans can be your best friend. Even if you don’t like wearing your eyeglasses, being able to see properly is always better than not! And they may save you a lot of hassle if you lose your contact lenses or solution when you’re travelling. So dig them out of the drawer and get them ready for action. If you follow all the above tips, you are sure to be prepared for every possibility. We can't think of much more to say other than "Bon voyage"!